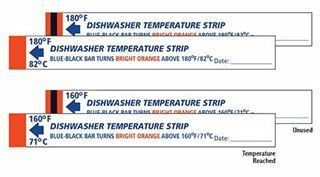 Single use, waterproof, irreversible color changing indicator strip that provides proof that sanitizing temperature has been reached. Designed to be dated, initialed and affixed to the wash batch record. Slotted strips ensure the indicator is secured on to a utensil or tray, reducing risk of falling off during a wash cycle. Section 4.7 of the Food Code calls for measuring sanitized food contact surfaces and utensils by an irreversible registering temperature indicator. Indicator size: 4.00" x 0.50"
Sold in packs of 25 pieces each.